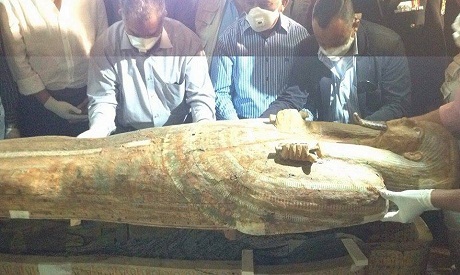 During today’s inspection tour in Luxor’s West Bank around the tomb of the 22nd dynasty’s Amenhotep-Hwi (TT28), Minister of Antiquities Mamdouh Eldamaty announced the discovery of the sarcophagus of a 22nd dynasty nobleman named Ankh-If-Khonsu. Eldamaty explained that the sarcophagus was found to be well preserved and in excellent condition after being unearthed from a niche carved in the tomb's rock. 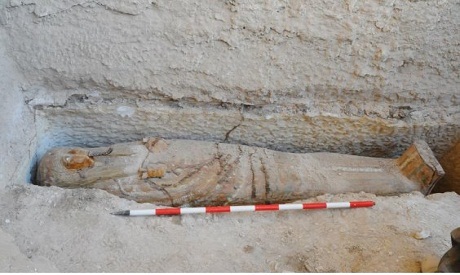 The find was made early this week by a Spanish mission from the Institute of Ancient Egyptian studies in collaboration with an Egyptian mission from the ministry of antiquities. 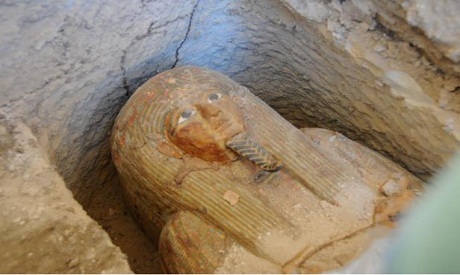 Head of the Ancient Egyptian Antiquities department Mahmoud Afifi said that the sarcophagus is in the very distinct style of the 22nd dynasty and it is carved from wood that is covered in a layer of plaster. The sarcophagus depicts the facial features of the deceased wearing a wig and a crown made of flowers. His chest is decorated with a necklace and he is holding papyri flowers. 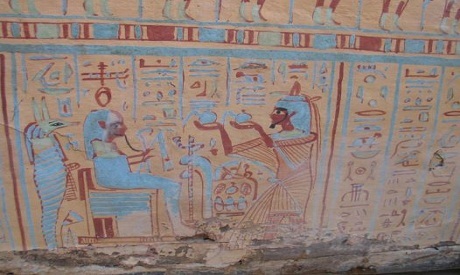 Afifi added that the sarcophagus is decorated with hieroglyphic texts and scenes depicting the deceased in different positions before deities Osiris, Nefertem, Anubis, and Hathor. 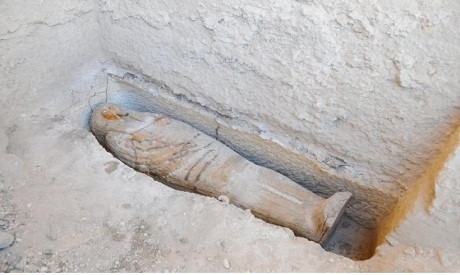 Sultan Eid, head of the central administration of Upper Egypt, told Ahram Online that the sarcophagus contains a mummy, but it has not been yet studied. Amrita offering: "The Elixer of Immortality"
That is a common icon of Egypt. It is used in the mummification process. Distinctly Hindu. This is a really beautiful find. Please keep us informed.